What would you do if you found out you had a twin you never knew existed? Such is the incredible true story of Samantha Futerman and Anaiis Bordier, two strangers (one, a French fashion student, the other, an actress in Hollywood) who by chance found each other on Youtube and Facebook. Thinking they looked remarkably alike, the young women discovered they were actually identical twins adopted separately at birth in Busan, South Korea and raised on different continents. A stunning piece of storytelling, and one of the year's most unforgettable documentary films, Twinsters opens in Los Angeles at the ArcLight Hollywood on July 24, and in forty more U.S. cities beginning July 31. 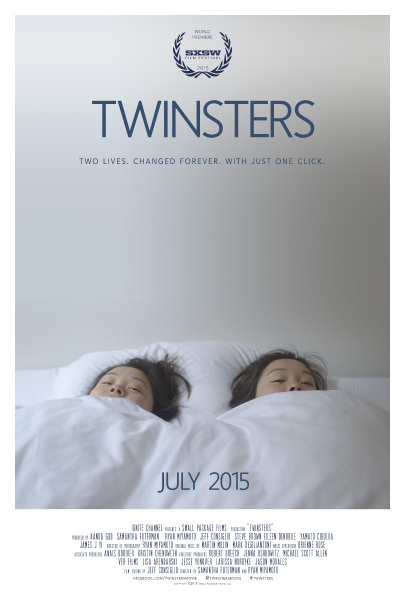 Twinsters (winner of a South by Southwest Jury Award earlier this year) chronicles the long lost sisters' journey to meeting at age 25, and ultimately follows them to visit South Korea where their separation took place. Seeking a creative way to cope with the intensity of the situation, Futerman (who also co-directed the film with Ryan Miyamoto) launched a successful Kickstarter campaign to make the documentary - and the movie was born. It is wild to imagine that just ten years ago, this entire story would have been impossible without the creation of YouTube and Facebook. Over the past six decades, at least 200,000 Korean children have been adopted into families in more than 15 countries, with a vast majority living in the United States. One of these adoptees is Jenna Ushkowitz, known for playing Tina on the hit FOX series Glee. Ushkowitz is also one of Twinster's executive producers, and has been a longtime friend of Futerman's. In fact, Ushkowitz and Futerman have recently partnered to form the Kindred Foundation for Adoption, a 501c3 non-profit supporting adoptees. The Kindred Foundation seeks to connect adoptees globally, and give them social and emotional support. Additionally Futerman and Bordier have written Separated @ Birth: A True Love Story of Twin Sisters Reunited, which has been published by Penguin. Ushkowitz comments on working on Twinsters.